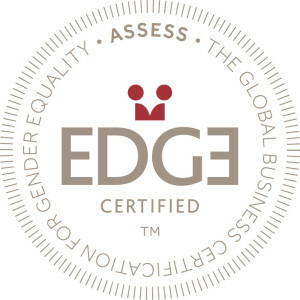 Gender Intelligence has partnered with EDGE to offer organizations guidance in global certification for Gender Equality. 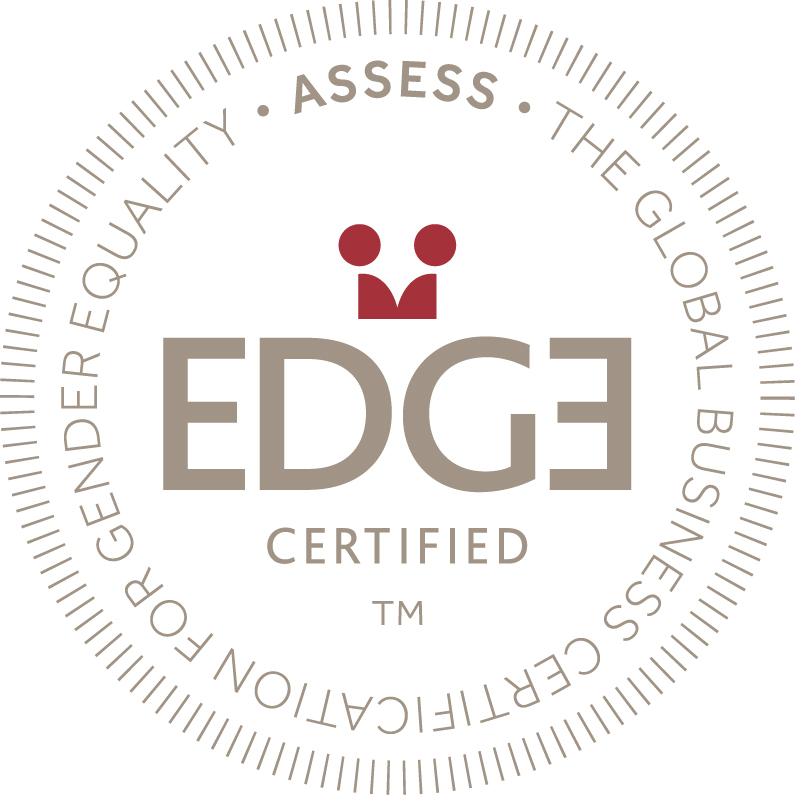 EDGE is the only global assessment methodology and business certification standard for gender equality. The EDGE assessment methodology was developed by the EDGE Certified Foundation and launched at the World Economic Forum in 2011 making its alliance with Gender Intelligence Group a breakthrough effort. EDGE Certification has been designed to help companies not only create an optimal workplace for women and men, but also benefit from it. EDGE stands for Economic Dividends for Gender Equality and is distinguished by its rigor and focus on business impact. The methodology uses a business, rather than theoretical approach that incorporates benchmarking, metrics and accountability into the process. It assesses policies, practices and numbers across five different areas of analysis: equal pay for equivalent work, recruitment and promotion, leadership development training and mentoring, flexible working and company culture. EDGE Certification has received the endorsement of business, government and academic leaders from around the world. The greatest outcome of GIG’s partnership with EDGE is in helping clients discover and achieve the global standard in gender equality. Gender Intelligence Group has entered into a strategic alliance with The Impact Center. GIG and the Impact Center will partner in the design and implementation of Gender Intelligence summits, leadership programs, and groundbreaking research and studies. The Impact Center is a premier leadership development organization for high-impact individuals and institutions whose mission is to empower emerging and accomplished leaders with the knowledge, skills, and network they need to expand their impact on their organizations, communities, and society. The Impact Center was selected in 2009 to manage the Obama Administration’s Presidential Appointee Leadership Program for senior Executive Branch leaders. As an ongoing program, the Impact Center continues to design and deliver programs that help top leaders more effectively serve the American people. In addition to its work with appointed leaders across the Administration, the Impact Center has been engaged to design and facilitate leadership programs for leaders such as the Secretary of Transportation and non-career appointees of the Department of Transportation as well as the Administrator and executive team of the U.S. Small Business Administration. Gender Intelligence Group has partnered with Sheryl Sandberg and LeanIn.Org to help create a global community dedicated to supporting women “Leaning In” to their ambitions by combining practical education and focused discussion to give women—at all level of their careers—the tools they need to realize their goals. Jointly developed with The Clayman Institute for Gender Research at Stanford University, Lean In Education is a growing series of educational materials on topics critical to success, ranging from negotiation skills to team dynamics. Lean In Education launched March 6th with The Clayman Institute as well as experts Fred Kofman (leadership), Marcus Buckingham (strengths), and Bill Hoogtrep (public speaking). A powerful addition is the inclusion of Barbara Annis & Associates, providing the science and inclusive leadership skills attained through Gender Intelligence training. Organizations the world over want to improve in their Gender Intelligence, attract the most talented women and men, sustain their growth and competitiveness in the global marketplace, and be recognized for their efforts. The greatest outcome of the GIG partnership with the Lean In Foundation is in helping women and men grow in their understanding, appreciation, and valuing of each other’s unique and authentic talents and skills. Sheryl Sandberg is Facebook COO, and author of Lean In: Women, Work, and the Will to Lead, and co-founder of Leanin.Org. To read Barbara’s inspiring LeanIn story click here. This self-assessment tool helps men and women better understand gender “blind spots” that interfere with workplace communication. Self-assessment is a critical starting point in addressing cognitive, emotional, and behavioral components that operate unconsciously in the workplace. Given the disparities between men and women globally, this tool will be a powerful addition to a suite of products offered by GIG as well as QED, designed to generate greater diversity awareness and skills world-wide. QED Consulting, founded in 1988 by Dr. Richter, provides strategic consulting and training in the areas of leadership, values, culture and change. QED has developed innovative products such as the Global Diversity Survey© and other ground-breaking learning tools such as The Diversity Game©, the Global Leadership Survey© and Global Words for Global Leaders©, an inspirational leadership video. QED has worked closely with many renowned organizations including Fortune 500 companies, leading universities, government agencies, and many international public sector organizations in Africa, Asia, Europe, and the Americas. Barbara Annis is Chair Emeritus of the Women’s Leadership Board at Harvard Kennedy School. The members of the Women’s Leadership Board (WLB) serve as key supporters and ambassadors to the Women and Public Policy Program (WAPPP), a research center at Harvard Kennedy School and global leader in gender research, teaching, training, and outreach. The membership is comprised of leaders from the most senior levels of government, business, academia, and the non-profit sector. WAPPP asks what we can do to create gender equality and improve the lives of women and men around the world. WAPPP focuses on rigorous, high-impact research that furthers WAPPP’s goal of closing gender gaps in the areas of economic opportunity, political participation, health and education. We then share research based recommendations with leaders across the sectors on the effective policies, organizational practices, and leadership strategies that help to close involuntary gender gaps around the world. Women of Influence is a company that provides integrated media, education and consulting, dedicated to women’s career advancement. Each of the programs, events and communications, serve to fill the gap for women looking for role models, looking to connect with like-minded individuals, and serving Fortune 500 corporations who want to speak to this coveted demographic of influential and affluent women as consumers and employees. We know that women need access to role models, and answers to their questions in order to succeed, which is why we offer multi-media and multi-platform programs to holistically provide the solutions to women’s career advancement.